Mayor LaToya Cantrell posted a warning Tuesday (Feb. 26) on Twitter, saying that viewing ladders will be “destroyed” along parade routes if they are placed illegally. City code forbids putting ladders along the roadside “during the pendency” of a parade, and they must be at least 6 feet from the curb. The mayor has the latitude to determine just what “pendency” means. She and her predecessors have generally set 24 hours in advance of a parade as the start of when ladders or other items are allowed along the route. Although in her Twitter message, Cantrell said nothing can be left overnight on sidewalks or the neutral ground. Reports on social media indicated city workers were collecting ladders Tuesday afternoon along St. Charles Avenue. A subsequent drive along the Uptown route from Napoleon Avenue to Lee Circle found the stretch was ladder-free. Leena Gagnon O’Hara was caught behind city workers removing tarpaulins from the neutral ground and placing them in a the bed of a work truck. “I was able to snap the picture because we were stuck behind him ... it made frequent stops and was driving at a snail’s pace collecting stuff." Leena Gagnon O'Hara took this photo Tuesday, Feb. 26, 2019, as she followed a city work crew removing tarpaulins from the St. Charles Avenue neutral ground. Cantrell’s enforcement continues a hard-line policy former Mayor Mitch Landrieu implemented last year, when city workers targeted ladders that had been chained together – also a code violation. In addition to ladders Uptown, the mayor’s office has said it will remove anything that blocks public access and rights of way. This includes the neutral ground along Orleans Avenue, where parade-goers have annually staked out sections of the median with spray-paint markings well in advance of the Endymion parade. The final week of Carnival season parades begins Wednesday, when the Krewe of Druids rolls at 6:15 p.m., followed by Nyx at 7 p.m. This means the earliest ladders can be placed along the parade route is 6:15 Tuesday night. 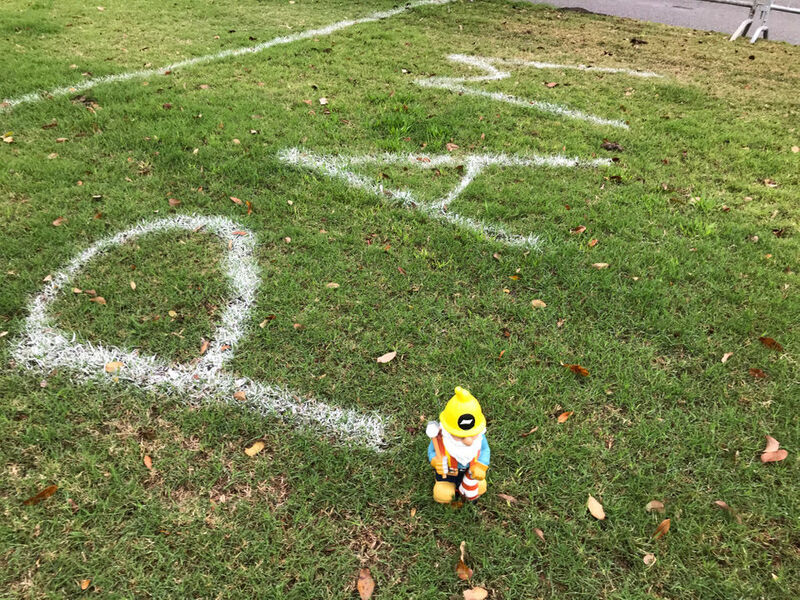 GNOLA the Gnome recently inspected the informal boundaries inside the neutral ground. - Kevinisha Walker and Michael DeMocker contributed to this report.